With 45% of Snapchat’s user base between the ages of 18-24 (prime college age), Snapchat is leveraging off their dominance with younger audiences to introduce Campus Publisher Stories to their Discover Section. A study conducted in partnership with MORI Research, indicated that college newspapers continue to reign as a top media choice among today’s co-eds and a sought-after source for campus news, entertainment and shopping information [Alloy Media & Marketing]. With 76% of all college students reading their campus publication in the past 30 days, the move to include these campus stories is a strategic push for the platform to remain relevant and dominant for younger audiences. 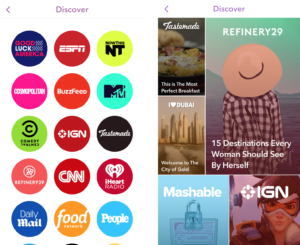 Snapchat launched ‘Discover’ in early 2015 as a means to achieving their goal of becoming a “destination for consuming news”. Our ambition is very much that when something happens in the world or there’s a news event, that our audience would turn to Snapchat increasingly to get that news” – Sean Mills, Head of Original Content. Since then, Snapchat have launched a series of Stories including some of the biggest names in publishing from The New York Times, Fox Sports, National Geographic and Harpers Bazaar. Snapchat have selected to partner with handful of colleges around the US including Berkeley, Texas A&M, Syracuse and The University of Wisconsin – Madison, to begin producing weekly Publisher Stories to be distributed on Snapchat. The move sees Snapchat nurturing the “talent pool” stating that many of the leading journalists and editors get their starts working in school newspapers and they plan to help each school monetise and grow their newspaper through a revenue sharing agreement (although we are not quite sure what this entails). Snapchat still seems to have a fair share of control in the content being produced, working with students to develop the “right” kind of content, with a focus on virality and shareability. The content will only be available to users within a close radius of the campus they are currently working with, aiming to create feelings of exclusivity and amplification of the community connectedness. No word yet on when this will be rolled out to Australian Universities. We’ll keep you posted.